To continue to operate a Home of Hospitality and Drop-In-Crisis Centre for those in need in our community, guided and directed by our Mandate and Mission Statement. >We give Counselling and Aid when needed to those who Fall Through the Gaps in the social system. ﻿1. (Year 1-3) Network with complimentary organizations while forming new partnerships and strengthen existing ones with agencies in our community, on ﻿behalf of those families and individuals in crisis who need our services and are at risk of falling through the gaps in the Social System. 2. 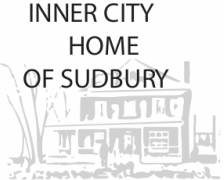 (Year 1) To further develop, promote and offer the Continuum Care Series, for those clients who have previously participated in Group Courses here at Inner City Home of Sudbury. Monitor and evaluate the needs of our clients so we can best continue to offer existing programs, offer and develop new programs that match the demand, for the well-being and health of our clients that is within the mandate and scope of our Services and Resources. 3. (Year 1) To develop, promote and offer Crisis Intervention for further training for Inner City Home volunteers who work "hands- on" with clientele who utilize our services. To offer and provide professional development, training and support for our staff and volunteers, who work tirelessly each day to meet the crisis needs of our clientele. 4. (Year 1-3) To be a Host Agency for University, College and various School Programs for their students seeking placement opportunities and on-site training and practical experience in their individual learning fields. 5. (Year 1-3) To re-evaluate our succession planning model, ie. future staffing changes and changing needs for the continued viability and sustainability of Inner City Home's Services and Programs. 6. (Year 1-3) To promote and heighten Community Awareness of Inner City Home's Programs and Services in the Community, through various fundraising events, presentations and donors. (Year 2) To maintain healthy and strong Board Governance for the future security of Inner City Home's operations and services, which may include the replacement of outgoing Board Members. (Year 2-3) Monitor and evaluate the needs of our Secondary hub location in New Sudbury, from a training and education standpoint, to ensure clients in this location do not fall through the gaps of our Social System. (Year 3) Re-evaluate strategic direction, mission and vision of Inner City Home to ensure that we are moving into the future with the best course of action, and placing our limited human and financial resources in areas that will maximize effectiveness and value.